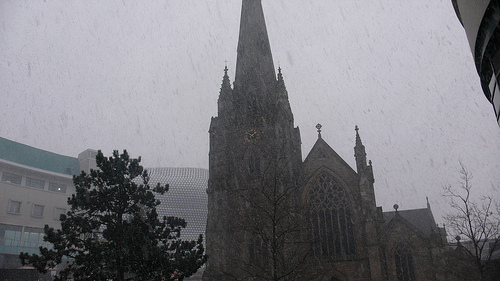 St Martins is one of 7 churches taking part in The Birmingham Churches Winter Night Shelter, which sees each church open up its building to 12 men each night to stop them sleeping rough on the streets. This is running from 18th January until 8th March. All the guys that come are given a hot meal as well as the opportunity to talk and make friends with all those who are volunteering. We believe this is a great opportunity to show the love of Jesus to the people of Birmingham. If you would like to volunteer to help out at the night shelter please email office@bullring.org or call the parish office on 0121 600 6020. If you know someone who wishes to be referred to the night shelter, they are welcome to come along to our drop in coffee morning on Monday 10am-12pm to refer themselves or visit SIFA Fireside in the mornings during the rest of the week. Please pray that our guests will be renewed and refreshed during their time with us. Please thank God for our volunteers and for equipping us to host our guests during this cold winter period in the city. My husband and I would like to volunteer ourselves to help in the night shelter on Christmas Eve night or Christmas Day – we look forward to hearing from you. It doesn’t start until Jan 18th so they do no Christmas shelter as far as I can see!